← That Esther McVey Hillsborough tweet. Who or what was behind it? 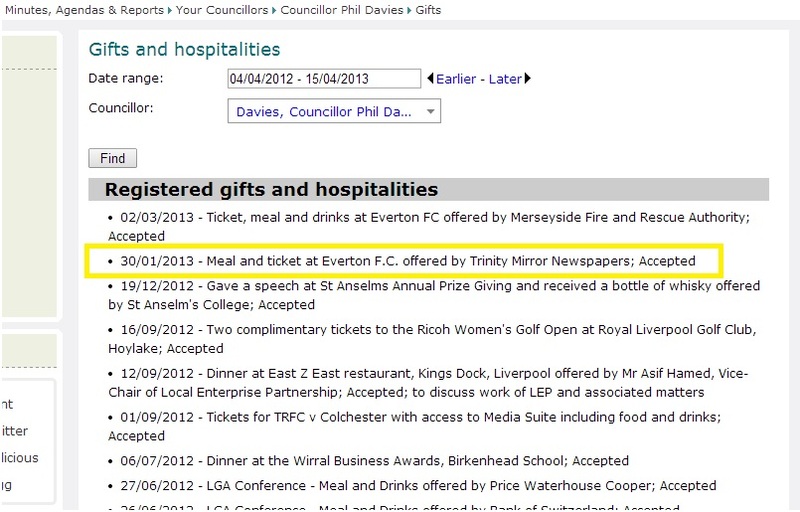 Back in January 2013, Council leader Phil Davies was offered a ticket for an Everton match, along with a free slap up meal – by Trinity Mirror Newspapers, owners of The Wirral News. Unlike The Wirral Globe, which is still going strong, faithfully pumping out Wirral Council scandal as and when it occurs, The Wirral News stopped including the stuff that nightmares are made of in February 2013, right after this football game. As far as Wirral In It Together are concerned, Trinity Mirror won’t be handing out freebies without expecting something in return. No siree. 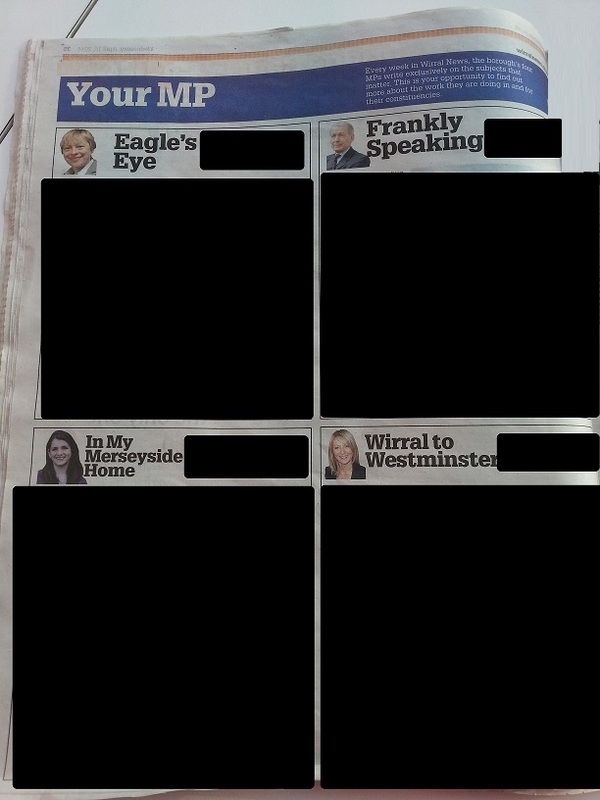 But how can the two competing local newspapers on Wirral be running such starkly differing versions of reality?! And what exactly are the kickbacks? Has anything worthwhile (paid for in public money) been funnelled in the direction of Trinity Mirror in the form of ‘thank yous’? I’ve no idea. But my antenna have been bristling for well over a year on this one now. Something stinks to high heaven. Here’s a full pager from a recent Wirral News – space which any local business or charity would give their eye teeth for. It’s reams of puff and bluster, vote grubbing stuff, courtesy of your 4 x political representatives, occupants of the ££Westminster bubble. Observant readers will spot how I’ve made some gentle redactions to stop the participants gaining even more free publicity via these pages. And I say free publicity, because nowhere on this item have I been able to find the tell-tale words “Advertising Feature” . This entry was posted in General and tagged Councillor Phil Davies, Register of Gifts and Hospitality, Trinity Mirror, Wirral Council. Bookmark the permalink.